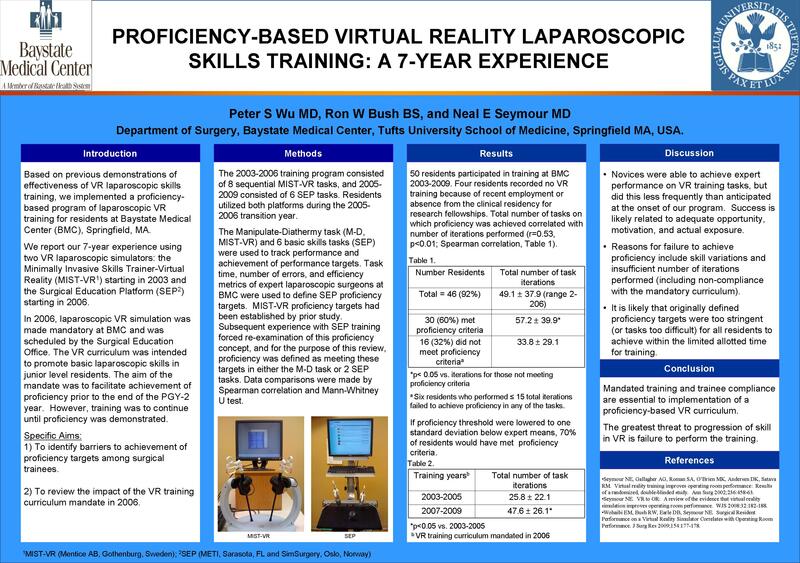 Introduction: Based on previous demonstrations of effectiveness of virtual reality (VR) laparoscopic skills training, we implemented a proficiency-based program of laparoscopic VR training for residents at Baystate Medical Center (BMC), Springfield, MA. We report our 7-year experience using two VR laparoscopic simulators: the Minimally Invasive Skills Trainer-Virtual Reality (MIST-VR; Mentice AB, Gothenburg, Sweden) starting in 2003 and the Surgical Education Platform (SEP; METI, Sarasota, FL and SimSurgery, Oslo, Norway) starting in 2006. The VR simulation curriculum was intended to promote early proficiency in basic laparoscopy skills in junior level residents. Methods: The 2003-2006 training program consisted of 8 MIST-VR tasks, and 2005-2009 consisted of 6 SEP tasks. Residents utilized both platforms during the 2005-2006 transition year. In 2006, training was made mandatory and scheduled by the Surgical Education Office. The Manipulate-Diathermy task (M-D, MIST-VR) and 6 basic laparoscopy skills tasks (SEP) were used to assess achievement of proficiency performance targets. Proficiency measures consisted of task time, errors, and efficiency metrics based on assessment of expert attending laparoscopic surgeons at BMC. The program aim was for all residents to achieve proficiency prior to end of PGY-2 year, but training was to continue until proficiency was achieved. Data comparisons were made by Spearman Correlation and Mann-Whitney U test. Results: Data for all 50 surgical residents over the last 7 years were reviewed. Thirty residents (60%) achieved proficiency in either the M-D task or 2 SEP tasks. Four residents recorded no data because of recent employment or absence from the clinical residency for research fellowships. Forty-six residents performed 49.1+/- 37.9 VR task iterations (range 2 – 206) over 2 years from start of employment. Average number of iterations per resident was significantly greater after training was made mandatory (2003-2005: 25.8+/- 22.1 vs. 2007-2009: 47.6+/- 26.1, p<0.05). Achievement of proficiency for total number of SEP tasks correlated with number of iterations performed (r=0.53, p<0.01; Spearman correlation). Six residents who performed 15 or fewer task iterations failed to achieve proficiency in any task. The 30 residents who achieved proficiency performed significantly more iterations than the 16 residents who did not achieve proficiency (57.2+/- 39.9 vs. 33.8+/- 29.1; p<0.05). If proficiency criteria were lowered to one standard deviation from expert performance, 70% of residents would be considered proficient with the training iterations reported. Conclusions: Our data strongly suggest that 1) it is possible for novices to reach expert performance in the training lab given adequate opportunity and motivation, and 2) it is possible that proficiency targets selected for our program were too stringent to be achieved prior to the PGY-3 level. Reasons for failure to achieve proficiency include skill variations and insufficient number of iterations performed (including non-compliance with the curriculum). The greatest threat to achievement of proficiency is failure to perform the mandatory training. We conclude that a training mandate and adequate trainer availability are essential to successful implementation of a VR proficiency-based curriculum.